Red-shanked carder (Bombus ruderarius). Photo credit: Linda Peall. A small, scarce bumblebee species which appears to be declining. Confined to the south of England and Wales with the exception of a strong population on Coll and Tiree. Generally, but not always, found in association with large areas of open grassland. Red-shanked carder bees. Photo credits: Elizabeth Hatchell. Queens and workers are very similar to the common Red-tailed bumblebee (Bombus lapidarius), but have red tibial hairs around the pollen baskets, long faces, and a generally smaller and rounder abdomen. 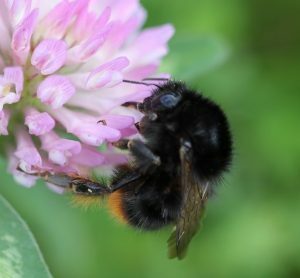 Males have greyish-yellow bands, much less bright than males of the Red-tailed bumblebee and similar to the larger Red-tailed cuckoo bumblebee (Bombus rupestris). 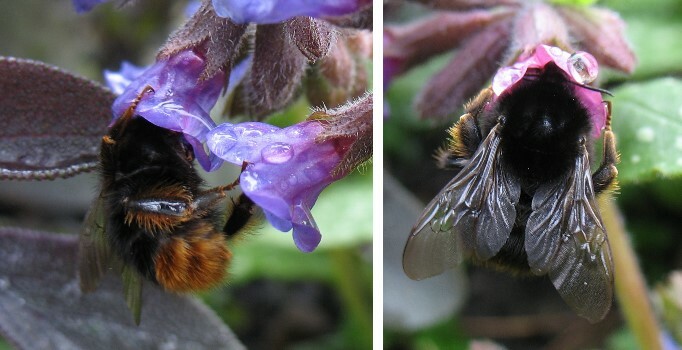 The banding pattern is similar to that of the Shrill carder bumblebee (Bombus sylvarum) but the yellow bands of the Red-shanked carder are much darker, almost blending with the black background (obviously straw-coloured in the Shrill carder), and the red tail of Red-shanked carders is a much brighter red than the washed-out orange of the Shrill carder bumblebee. The male genital capsule is useful to check the ID, particularly of worn specimens.